The mission of PartnerShip is to help our customers ship smarter and stay competitive. The only way we can do that is to partner with great carriers and we love recognizing our awesome partners! 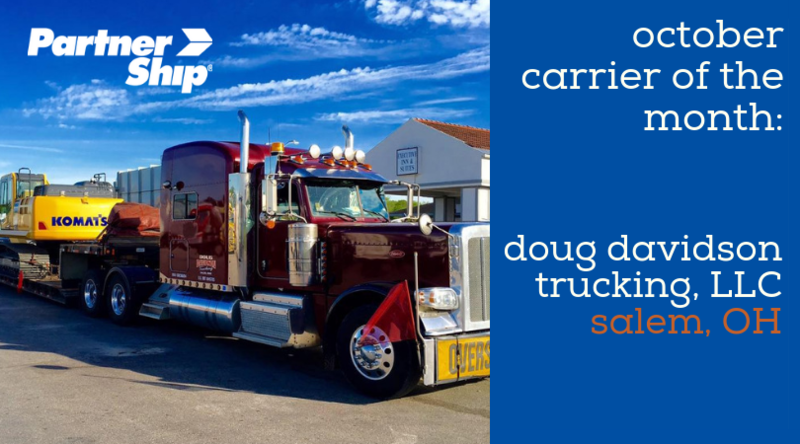 Our October Carrier of the Month is Doug Davidson Trucking LLC of Salem, OH. With 27 years of trucking experience, they specialize in oversize and overweight loads and operates a fleet of 11. They are fully committed to on-time pickup and delivery with safety as their number one goal. The reason PartnerShip has a Carrier of the Month program is to recognize carriers that do an exceptional job helping customers ship and receive their freight. PartnerShip team members nominate carriers that provide outstanding communication, reliability, and on-time performance. As our October Carrier of the Month, Doug Davidson Trucking gets lunch for their team and an official framed certificate to proudly hang on their wall. Consider becoming a PartnerShip carrier because we try very hard to match our freight carriers’ needs with our available customer loads because we understand that your success depends on your truck being full. If you’re looking for a backhaul load or shipments to fill daily or weekly runs, let us know where your trucks are and we’ll match you with our shippers’ loads. If your wheels aren’t turning, you’re not earning.